Imagine this. Sun rays break through clouds promising a bright, cheery and rain-free day ahead. You decide to dress up and leave for work or to simply do some pending chores. Suddenly, you get caught in a downpour that leaves you soaked, grumpy and moving around in a mood worse than the grey skies. If this has happened to you in the past, it means that just like me, you find it tricky to decide your dressing style during monsoons. And just like me you hate deary black umbrellas, plastic footwear and flimsy wind breakers. So, how does one dress up during monsoons? Here is a quick guide. Whatever you choose to wear, select the fabric wisely. Avoid linen as it may crumple easily and knit wear as it does not dry soon. Also when it stops raining, the weather will turn sultry so take humidity into account while choosing fabrics so avoid silk as well. Cotton and mulmul are great choices. Avoid wearing whites or extremely light colors during monsoons and choose sturdy colors that make mud splashes less visible. Monsoon is the best time to flaunt ankle length trousers, capri pants and leggings in fabrics that are quick drying and do not weigh you down when wet. Pair them with shirts or long sleeved t-shirts, tunics or kurtis for a fuss-free look. Cotton culottes are a great choice too! Umbrellas are insufficient during heavy rains. Invest in a superior quality waterproof jacket that offers good protection against the relentless downpour and chilly winds. Do choose a jacket that covers your thighs, so that you don't end up feeling cold and wet. Mud and muck are unavoidable during monsoons. Nowadays there are many appealing options available in the market that look stylish and help keep our feet dry. Choose from no-frills, clean styled water proof boots or go for trendy clear jelly rain boots that reach up to your ankles, keeping you dry as you splash around :D. If you like open footwear there are many options of waterproof jelly sandals/ flip flops available too. Depending on your choice, choose a lightweight compact umbrella, fixed shaft umbrella or a bubble umbrella. 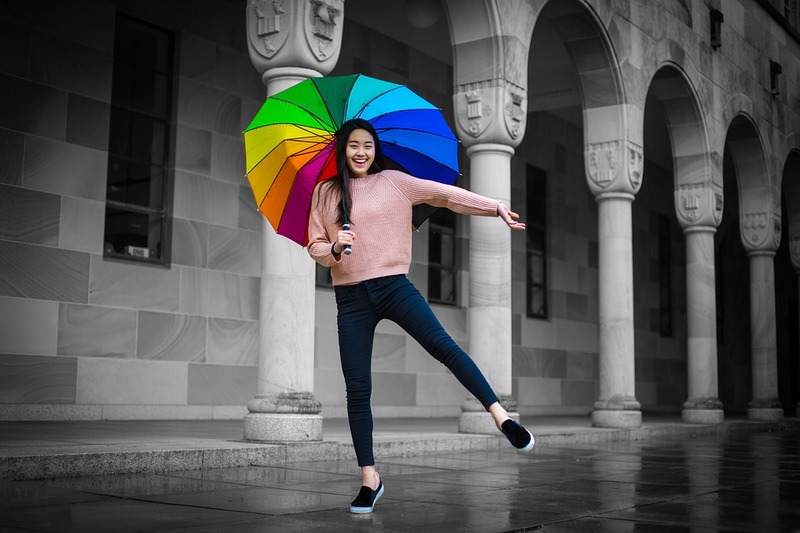 Compact umbrellas fold to a smaller size easy-to-carry around size while the fixed shaft umbrella are more sturdy but leave you with a cane like stick. A bubble umbrella helps cover the entire head and are mostly transparent in nature to enhance visibility. Instead of leather, choose an all weather or waterproof jelly bag in bright colors to keep your belongings safe from getting wet. Resistant to wetness and moisture, its a great way to keep your gadgets and accessories safe. Add an extra layer of protection to all your gadgets and place them in your water resistant bag and you are good to go! Don't just switch to water proof make-up to avoid meltdowns caused by humidity mixed with unexpected rains. Instead rethink your entire routine. Try substituting liquid foundation for something lighter like face powders or if you must use mineral foundation powders. Use powder eye shadows instead of cream based and avoid using mascara. Accentuate eyes with pencil liners and use matte lipsticks that do not smudge easily. Very well written. It helps to look stylish as well as tension free during monsoon.